After showing a couple of people my blog, it was a go. 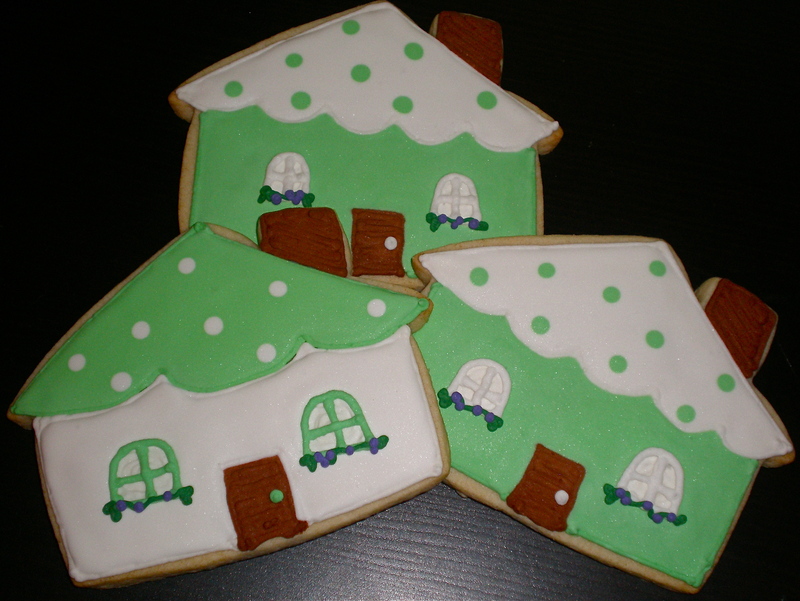 Cait and I discussed colors and cookie shapes (is it still “discussed” if it’s through email? Well, you get the point). I suggested fall colors. I know, I’m big on that these days. But, have you looked outside? If you live in the mid-Atlantic we are in prime fall leave season, people. Sorry to my readers in California. Perpetually green. Bummer. Where was I? Oh, fall colors. Right. Some fall leaves. She was obviously looking out her window! A few houses. Very appropriate since the basket was for an attorney who helped with the closing of a real estate deal. And, finally, a couple of large medallions. To be sure the there was no confusion as to why, to whom or from whom. I will say, I now understand why cookie basket companies use sticks. There is clearly not a lot of height differential in my little basket here. That said, I still think it turned out pretty darn cute. And I love how the basket mimics the fall feel. Hopefully they were the perfect thank you. 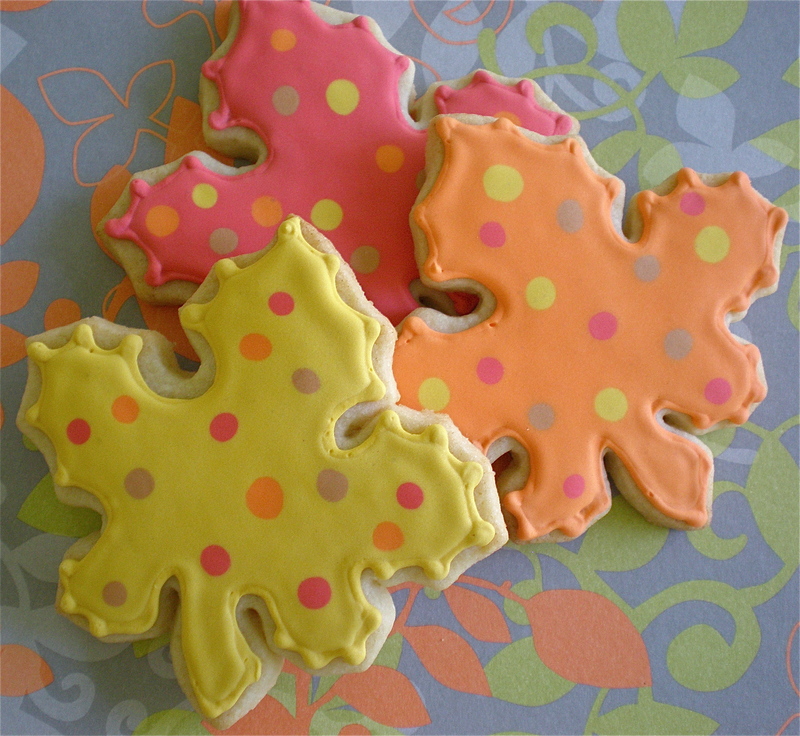 And who needs flowers when we have these leaves?!? 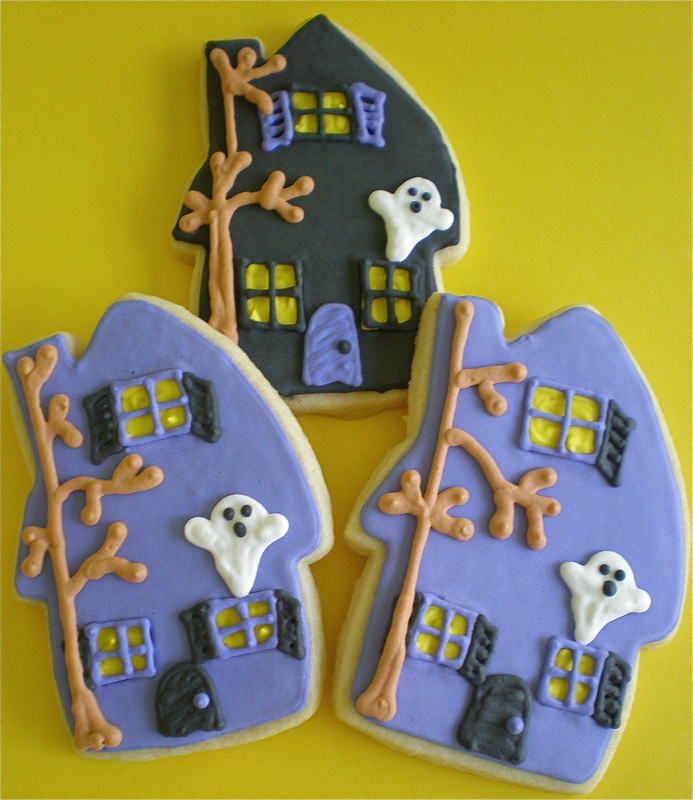 Tags: baskets, custom cuts, fall, houses, sugar cookies, thank you! My first haunted house experience was back in middle school. My friends and I went a couple of times and it was honestly one of the scariest things ever. Even the boys were screaming (don’t worry, I won’t name names). I still have nightmares about the chainsaw people. 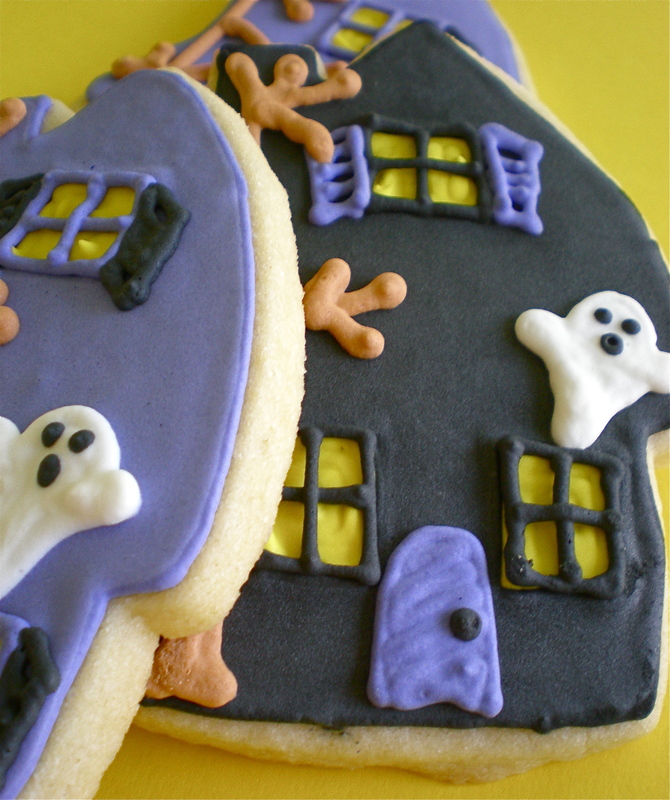 Cookie number three… Haunted House. The shutters hanging askew. The leafless tree looming out front. The menacing ghost keeping watch. 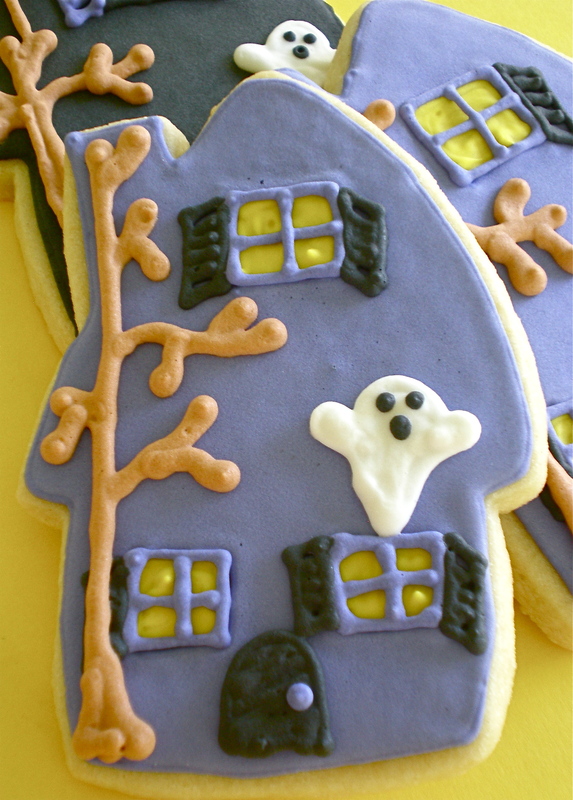 Be sure to place your Halloween order by October 24!!! Any questions, let me know. I am a huge proponent of community service (as I hope everyone is!) and have done various projects over the years, from tutoring to visiting nursing homes to building houses. I get it rightfully so. My mom has volunteered for everything from cooking for the homeless to crocheting blankets for ill children. For nearly a decade, Mom also has been involved with Christmas in April * Prince George’s County. As you can imagine, the financial need of non-profits is highest during a recession. Unfortunately, a recession means donations are down… considerably. This was the very topic during a recent discussion my mom had with a Christmas in April staff member. Luckily, my mom thought I could help out in my own way. 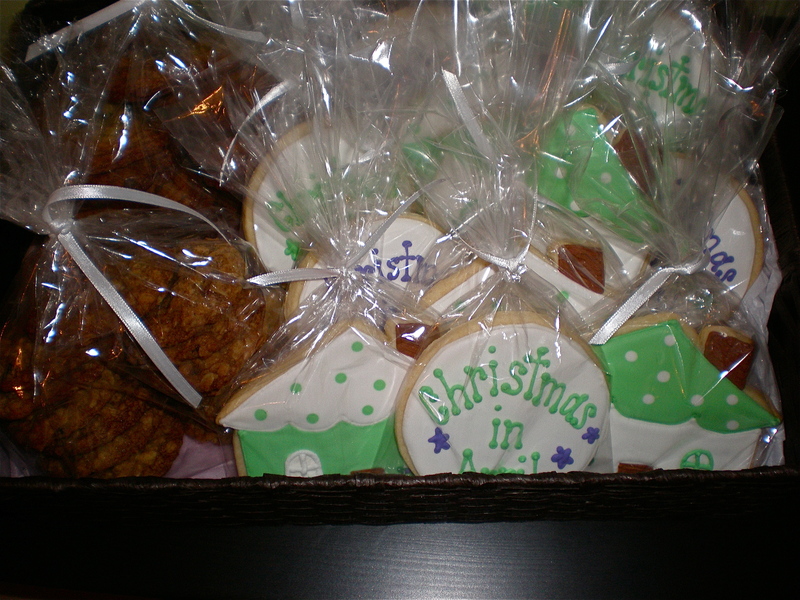 She offered a Kristina’s Confections basket for the upcoming Christmas in April fundraiser – a golf tournament and silent auction. I was more than happy to donate a basket for such an amazing cause. 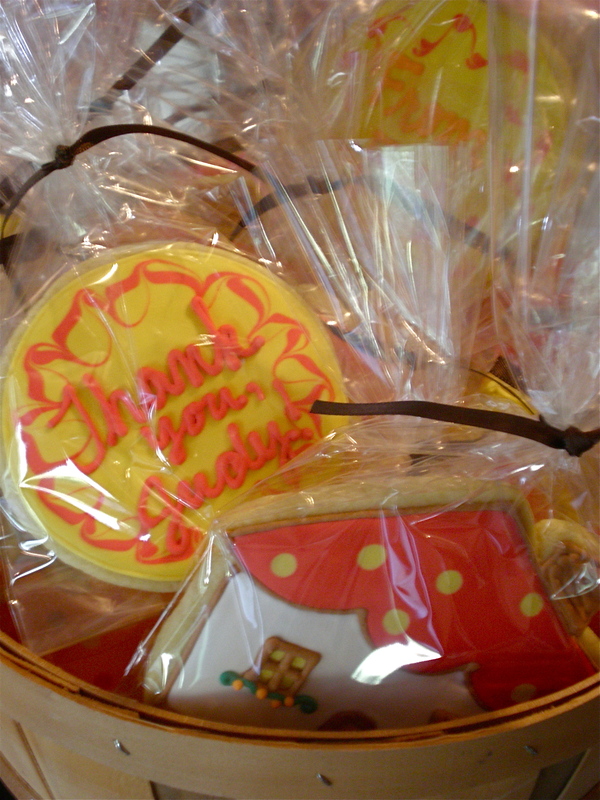 For the basket, I had to do some personalized sugar cookies. Houses were a given. 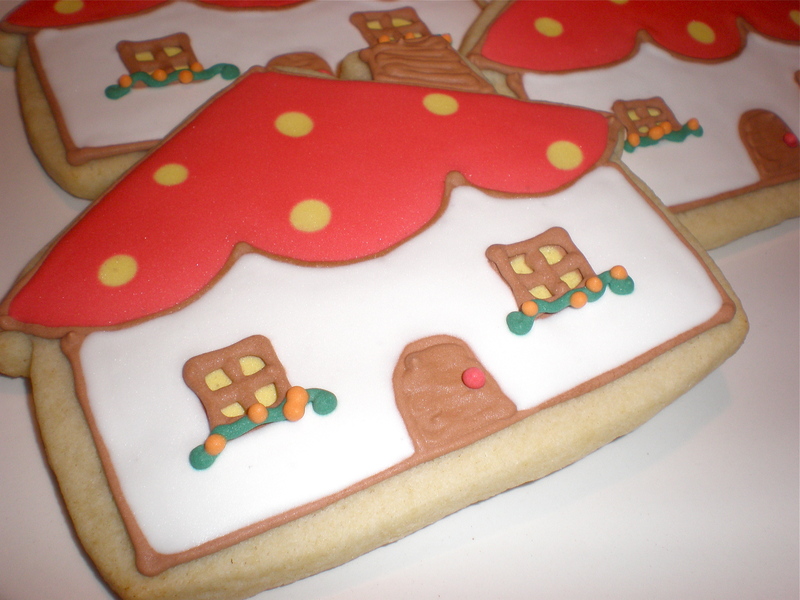 Don’t you just want to live in one of these? I like to think these are happy little cottages. I added a couple dozen Grandma’s Cookies, for good measure. The Christmas in April fundraiser takes place today. I hope it is a resounding success… and that my little basket does it’s little part. And to you friends, I encourage you to donate – however, you can, big or small – to your favorite charity. There is always a need, but I promise you the need is so much greater right now. Every bit helps!